“One of Middlesex University’s strategic aims is to engage our students in active, practice-based learning that creates highly employable graduates. In our efforts, we strive to train our students so that they can be parachuted straight into the industry after graduation. Therefore, the experience of working with the latest, state-of-the-art equipment before going on to work for companies including the BBC, Endemol, and Sky TV is paramount. During this process Canon emerged as the clear leader. “The products are designed to last and with the operator in mind, they’re broadcast approved and offer new technologies across both Photo and Video Cameras, like Dual Pixel Autofocus which is a great feature for the students to learn on. But it was often the small things that made the biggest difference” says Daniel. “Take the menu systems, they’re laid out in a consistent and intuitive way and transitioning from a DSLR to an EOS C Camera is simple. This proves to be a massive advantage for the technical support teams who are working to their limits in turning kit around. Making this process quick and simple really has helped maximise the time the kit is in a student’s hands. We’re able to check kit in when it’s returned much quicker and explaining how to operate the kit to new users is much simpler”. “The ability to run one lens mount platform also helped us consolidate our range of lenses and remove the need for lens adaptors which were permanently being lost! We’ve even been able to add EF Cine Zoom lenses which gives the students such a different experience not to mention amazing results”. In the end the University chose a wide range of Cinema EOS cameras, Camcorders, DSLR, EF lenses and Cine lenses. Ian Barnard, Sales Director at Canon, says “This is a ground-breaking transaction for Canon in Education. By working closely with both Middlesex University and the dealer, ProAV, we were able to understand the university’s needs and tailor a custom solution and propose a different way of procuring. Lease purchase is common-place in the broadcast industry and it seemed logical for the university to mirror the industry it’s preparing students for, as the demands are largely the same. Azule created a bespoke deal for Middlesex which included a primary and secondary lease period. Daniel says, “With the help of Azule, we looked into operational leases. Peter Savage, CEO of Azule Finance, devised an agreement which gave us maximum operational flexibility to swap and change equipment throughout the lease. It also allows us to spread the cost of acquisition over five years through fixed, monthly payments, meaning the risk of unexpected price depreciation is carried by Azule, rather than by Middlesex, which helps with financial planning. Purchasing this way also allowed Daniel to leave the majority of his budget intact, whilst bringing forward purchases from future years. “We now have a have a clear acquisition strategy which maximises spend and will allow us to continue to provide more of the latest equipment to our ever-growing cohort”. Canon have a well-established relationship with Azule and Ian Barnard tells us “Azule is highly regarded in the media industry, as they are industry experts. They work fast and effectively and make sure that their clients are getting the best deal”. 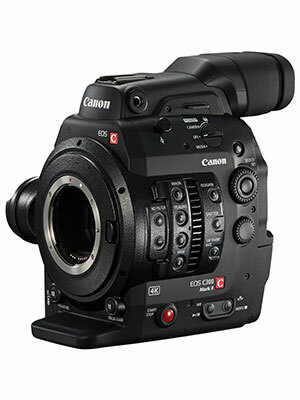 Middlesex University obtained the equipment through Canon dealer ProAV, an experienced international supplier of broadcast and professional video equipment, who also aided them in the selection, supply and accessorising of the equipment.